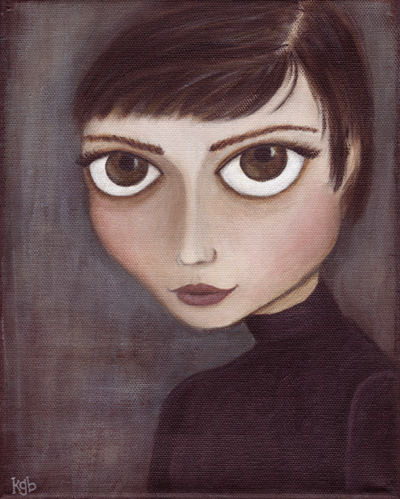 Inspired by one of the ultimate style icons, Audrey Hepburn, I wanted to paint a portrait that brought her to life as one of my own girls, in my own big-eyed, pop art kgb style. It was a tough painting because the photo that really grabbed me was one with her head tilted down, looking up at the camera. Great photo, very difficult pose to paint. There are things you just can’t replicate in paintings without looking…well, terrible. There was a harsh shadow under her nose, for example, and when I painted it in, it looked like I’d given her a mustache! No good. The shadow had to go. I really like the way it turned out, much darker than my usual girls, but still smiling sweetly. I have no desire to become a photo-realistic painter, so adding a bit of my own style & changing up expressions & poses suits me just fine. If you want an exact replica, why wouldn’t you just snap a photo? I have a huge amount of respect for the technical skill that goes into ultra realistic paintings, but I just don’t see the point. Paint is so much fun to play with! I *want* to see the brushstrokes, raised texture, the inherent painterlyness!!! Before I get too rambly here, I’m going to turn off the computer & head outside. I see a bit of sun peeking out & I’ve been rushing to get everything wrapped up in time to catch it. Happy Monday!